and quizzes reinforces learning The innovative "Math Flash" feature offers helpful tips and strategies in each lessonincluding advice on common mistakes to avoid Skill scorecard measures the student's progress and success Every answer to every question, in every test, is explained in full detail A final exam is included so students can test what they've learned When students apply the skills they've mastered in our workbooks, they can do better in class, raise their grades, and score higher on the all-important end-of-course, graduation, and exit exams. 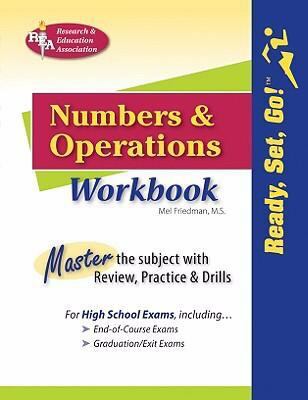 Some of the math topics covered in theNumbers & Operations Workbookinclude: Place values Rounding Signed numbers Fractions Decimals, fractions, and percentages Exponents Order of operations Integers and more! Whether used in a classroom, for home or self study, or with a tutor, this workbook gets studentsreadyfor important math tests and exams,setto take on new challenges, and helps themgoforward in their studies!